On their Airbus A330-200/300 fleet, Turkish Airlines utilizes four different business class configurations. Three of them feature lie-flat seats and one of them features standard recliner seats (similar to domestic first class seats). 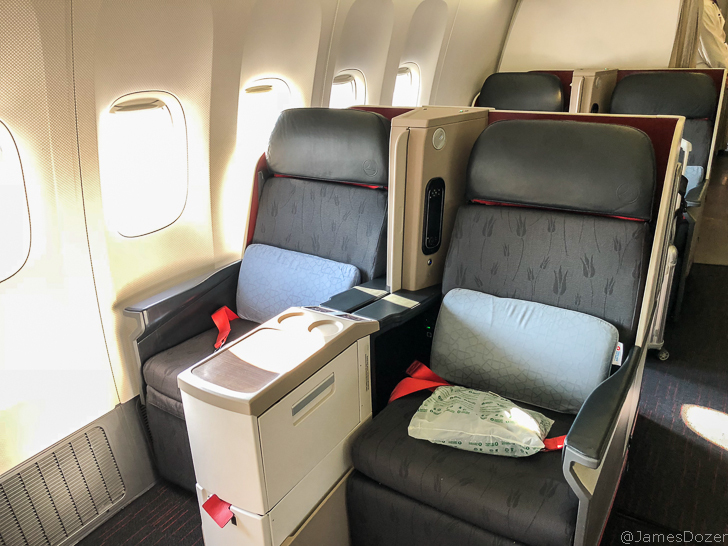 On their newer Airbus A330 aircraft, Turkish Airlines Business Class features its newest business class product, which is the same product found on their Boeing 777-300ER aircraft. Similar to the ones pictured below, they are standard forward-facing, lie-flat seats configured in a 2-2-2 layout. On some A330-200 aircraft, Turkish Airlines features an older, first-generation lie-flat seat. These seats are also forward-facing, lie-flat seats configured in a 2-2-2 layout. They are very similar to the current seat but are not as comfortable and lack storage spaces at the seats. These are the same seats used by other airlines such as Air China on their Airbus A330s and LOT Polish Airlines on their Boeing 787s. Turkish Airlines used to have these seats on their Boeing 777-300ER aircraft but they have since retrofitted them all with the newer seats. The third variation found on their Airbus A330 aircraft, in my opinion, is the least desirable. They are not ideal for overnight flights as they are standard “domestic first class” recliner seats configured in a 2-2-2 layout. These are the same business class seats found on their narrow-body aircraft. They are plush, comfortable and provide a deep recline but don’t compare to lie-flat beds. And lastly, in this post, I will review their most unique variation, which is a lie-flat herringbone seat. 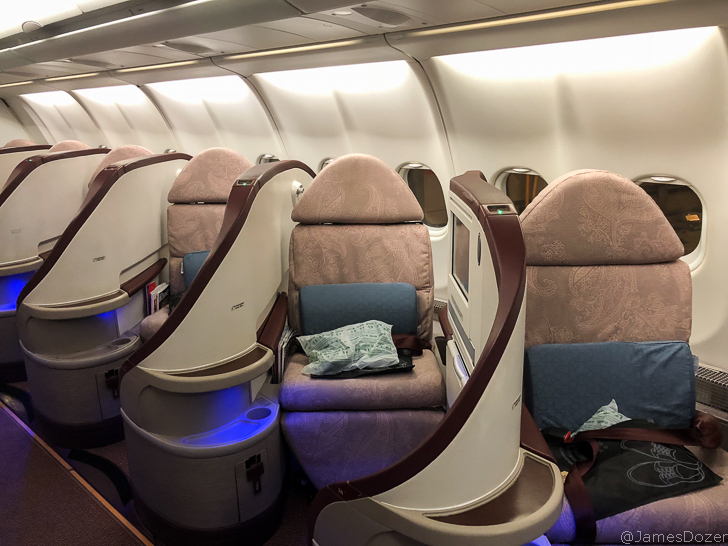 These seats may look familiar to you as they are the same seats used by other airlines such as Air New Zealand, Etihad and Virgin Atlantic. More specifically, these are the former Airbus A330-200 aircraft that have been taken over from Jet Airways. These are the only business class seats in Turkish Airlines’ fleet that offer all passengers with direct-aisle access. These former Jet Airways A330s are configured with 30 lie-flat, herringbone seats in a 1-1-1 layout. There are six rows of seats in the forward business class cabin and the columns are lettered A, D and K. Seats in column A and D face towards each other and have less privacy from your fellow passengers, whereas seats in column K are more secluded. Instead of facing other passengers, seats in column K face a wall, which is more ideal. Here is the aisle in between the A and D seats. And here’s a typical seat in column A. These seats have less privacy as you’re facing towards the other passengers. However, the privacy is reversed in the rear business class cabin. There are four rows of seats in the rear business class cabin and the seats are lettered A, G and K. This time, seats in columns G and K face towards each other, whereas seats in column A are afforded with more privacy. In addition to a wall, there is a full-length curtain that can be drawn to fully enclose the G and K column of seats. On certain flights, the G and K column of seats in the rear business class cabin are used as crew rest seats and the curtain will be drawn to give them more privacy. Note: SeatGuru identifies this configuration as “version 3” on their website but their description is not entirely correct. The column lettering is wrong and the business class seats in the rear cabin are facing the wrong direction. At Istanbul Airport, Turkish Airlines operates the Turkish Airlines Business Class Lounge for their premium cabin and elite frequent flier passengers. The two-story lounge is massive and offers a host of amenities for transiting passengers. The lounge is a favorite among travelers but unfortunately, has become too loud, crowded and unusable as of late. I used to love this lounge but I no longer find the experience relaxing or usable to be productive before a flight. You can click here to read my full review of the Turkish Airlines Business Class Lounge. At approximately 12:40 AM, I left the Turkish Airlines Business Class Lounge and made my way to gate 218. From the lounge, it turned out to be only a 10-minute walk but I wasn’t sure how far the gate was or if there would be any additional security checks at the gate. There weren’t any so I arrived with plenty of time to spare and just found a seat with everyone else. Boarding was announced 40 minutes prior to departure time; starting with business class passengers and elite frequent fliers, followed by general boarding. All passengers boarded through door 2L. On this trip, I was originally assigned seat 4A, a window seat on the left side of the aircraft. But luckily for me, the load was light and I was able to later move to seat 6K. I think 6K is the most private and spacious seat in the house and I would recommend it if you are traveling solo. Waiting at our seats were a pair of slippers, a day blanket and a memory foam back pillow. I love these back pillows. They are comfortable and do a great job of supporting your lower back. In addition to facing a wall for increased privacy, seat 6K also gives you another shelf to place your personal items on during flight. Each seat is equipped with a personal in-flight entertainment (IFE) system, two individual reading lamps, one USB port, and one universal electrical outlet. There are no personal, overhead air vents. These seats measure 21 inches in width and provide a bed length of over 70 inches. Storage-wise, these seats aren’t the best. Your carry-on bags can be stored in the overhead bins and there is a small pocket at your seat for your personal items. You can kind of store stuff underneath the ottoman but I found it to be a little small for a backpack. These seats were definitely older and parts were coming apart but they weren’t terrible. As I settled into my seat, the flight attendants came by with pre-departure beverages, headphones, amenities kits and a selection of international newspapers. I’ve already said this before but I’ll say it again. I really love these Denon branded noise-canceling headphones provided by Turkish Airlines. They are comfortable; they sound great and do a fantastic job of blocking outside noise. On this flight, Molton Brown amenity kits were provided for all business class passengers. The amenities kits are large and can be repurposed for later use but they are on the more feminine side. They kind of look like makeup bags and I don’t think many guys will be reusing them. Inside, there were socks, eyeshades, earplugs, a shoe horn, comb, dental kit and facial products (lip balm and facial hydrator) by Molton Brown. Once all the passengers were boarded, the captain came on the PA to welcome us onboard. We then made our way to the runway and took off for our flight to Mahe. Once we reached our cruising altitude, the flight attendants came by to take our meal orders and asked if we wanted our beds turned down right away. Some people opted to sleep through the first meal and asked for their beds to be prepared. I wanted food so I placed my order. Here’s the menu. Our supper was definitely more of an express service than a full meal service. Instead of an elaborate multi-course affair, our salad, appetizer and dessert were all served on one tray. After that, the main dish was served. I went with the flight attendant recommendation, which was the meatball brochette. As with all things Do&Co catering, it was delicious. The entire service was friendly and personable but also very efficient. The flight attendants were friendly and came by frequently to refill drinks and check on passengers but also moved things along at an appropriate pace. My plate was then cleared and my bed was made. Turndown service included a bed sheet, blanket and another pillow. I personally like these seats but I do know some people complain about them being too narrow and “coffin-like.” I didn’t have a problem with the bed itself but the cabin was kept a little too warm for my liking. While the flight attendant was making my bed, I checked out the lavatory and changed into my pajamas. There were three lavatories for business class passengers and they were all standard lavatories. Full-size bottles of Molton Brown soap and lotion were provided for use during flight. After that, the cabin lights were dimmed and the window shades were closed. I got some work done during the light show and then took a short nap before waking up for breakfast. Breakfast was served approximately 1.5 hours before our arrival into Mahe. Breakfast started with an appetizer plate consisting of some fruit, cheese and cold cuts, followed by my main course. I ordered the traditional black sea region omelet, which was interesting. It didn’t taste bad but it wasn’t my favorite dish. My plates were then cleared as the flight attendants prepared for our arrival into Mahe. The arrival views were pretty amazing. Overall, I enjoyed this flight from Istanbul to the Seychelles. The plane was old and the equipment wasn’t in the best condition but the seat wasn’t bad. My seat offered a ton of privacy and the lie-flat bed was comfortable. Service-wise, I had a really great crew. They were friendly and personable but also very efficient for this red-eye service. The food was tasty and the amenities were appreciated. Have you flown with Turkish Airlines on this configuration before? If so, please share your thoughts with us in the comments section below. Thanks for reading!